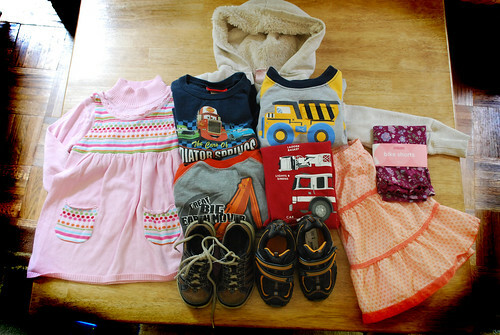 Last Friday I started my quest to find some fall/winter used clothing for my kids. I know stores are starting to put out fall clothes so I thought now might a good time to start. I was right. The first consignment store I hit starts accepting winter clothes July 1st. They already had a decent selection of items and it did not seem totally picked over. While I was checking out, I was making small talk with the cashier and she mentioned that she had boxes of clothes that they did not have room to put out yet. She let me weed through the boxes with the sizes that I was looking for. Guess it pays to be friendly. The second store I went to was a little more expensive, but I found some items that I knew would be perfect for my son. 1. 4 long sleeve t-shirts for my son. All sporting some sort of locomotive, which is currently all he will wear. 2. 2 pairs of Stride Rite shoes for my son. He has a very wide foot and Stride Rite fit him the best. These shoes look brand new. They are a big for him now, but hopefully by winter they will be perfect. 3. Janie & Jack skirt for my daughter. Ok, I know I am supposed to be shopping for winter clothes, but I could not resist. Besides, she will be able to wear it next summer for sure. 5. Gymboree sweater for my daughter. I found this one digging through the boxes. It is really cute. 6. Furry sweatshirt jacket for my daughter. I also found this digging through the boxes. It is a good medium weight so she should get some good use out of it. I was very happy with my first round of shopping. Maybe this won't be too hard after all. What awesome stuff! Looks like you scored.